Fashioned of silver, frangipani blossoms in a Balinese garden. Buds of faceted amethyst poise on sterling tendrils, and a Mabe pearl glows like moonlight. Buana crafts an exquisite necklace with the magic of nature. 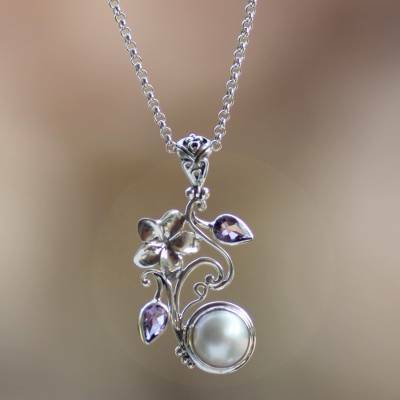 You can find cultured pearl and amethyst flower necklace 'Bali Garden' by Buana in jewelry categories such as Floral Necklaces, Birthstone Necklaces, Pearl Necklaces, Amethyst Necklaces, PEARL Cultured Necklaces, PEARL Mabe Necklaces, Silver Necklaces, Sterling Silver Necklaces and Pendant Necklaces. Enjoy exploring these sections for other Novica treasures. I bought this as a gift. It looked cute and petite in the picture. In person it is much larger. Not to my liking. A photo with a model wearing it would have been helpful.